Regina Sophia Hall, was born 22 October 1865 in Italy Cross, Lunenburg County, the daughter of Rufus Hirtle and Adelaide (Hiltz ) Hirtle. Regina married William Allan Hall on 4 August 1888 in the Presbyterian church, Bridgewater by license. William Allan Hall was listed as a teamster. They had the house built in 1895 and lived at 61 Phoenix Street at the corner of York in Bridgewater. They had four sons: Everette, Carroll, Roy and Warren. Her husband Allan and two sons Roy and Warren predeceased her. Regina Hall died 12 December 1952. A funeral service was held at St. Paul's Lutheran Church with burial in Brookside Cemetery, Bridgewater. In 1867, Simon Ernst established a jewelry and watch making business on King Street, just below Phoenix Street in Bridgewater. Prior to his establishing his own store, Ernst studied under Mr. Brown, possibly the first watchmaker in the district. For many years, Mr. Frank Foshay was a watchmaker for Mr. Ernst, while Ernst’s daughter Anna managed the business. In a newspaper advertisement in 1887, Simeon Ernst advertised he had on hand a full line of watches, clocks, jewelry, silver-plated ware, and had the largest and best assortment of spectacles in this County. On January 12, 1899 Simeon Ernst’s business was destroyed in the fire of 1899, but he rebuilt the store about 100 feet south of the old location on King Street, below Phoenix Street. Gradually as Simeon's son Bernal Ernst got older, he learned the watchmaking trade. In 1906, it was reported in the Bridgewater Bulletin that “Bernal Ernst has fitted up a building for electro-plating in the rear of his father’s store. The appointments are complete and Mr. Ernst will soon be ready for business on a large scale. “ Bernal Ernst worked for his father for many years and eventually took over the business after his father Simeon’s death 17 January 1933, running the store until he retired. Description: Small rectangular plain dark purple velvet jewelry case. Lined inside with ivory satin on top of lid and ivory crush velvet insert. Inside top lid is printed: Simeon Ernst Jeweler Bridgewater, N.S. Bottom of case has a section that can be removed which has two small cut outs in the velvet to attach and remove the necklace. A small round brass pin closure is attached to bottom lid to open and close the jewelry case. 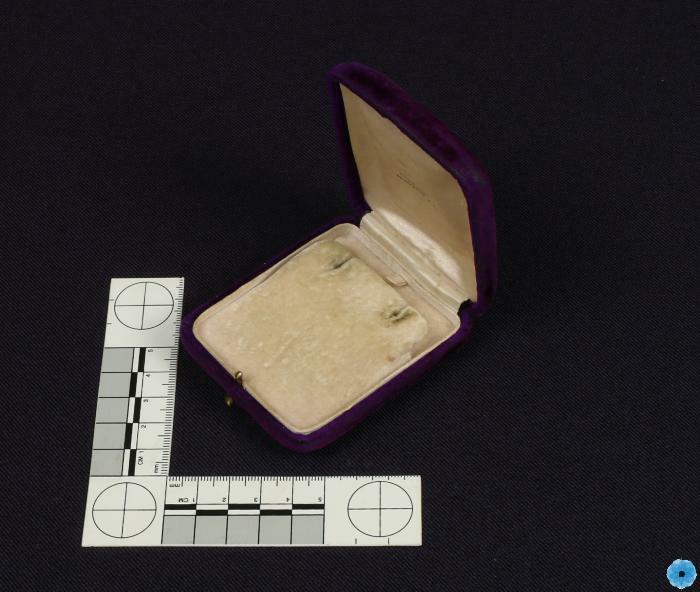 History of Use: Case was used by Regina Sophia Hall of Bridgewater to store a necklace which was sold by Simeon Ernst Jewelers.